The endearing story of "E.T. The Extra- Terrestrial" first brought moviegoers to tears in 1982. WASHINGTON – Where were you in 1982? You were likely in a theater, munching on Reese’s Pieces and choking up at the story of an alien 3 million light years from home. The story of “E.T. The Extra-Terrestrial” first hit the big screen on this date 30 years ago. Fittingly, the film will celebrate its anniversary with a special Blu- ray release this fall. It will be a remastered version of the 1982 original, not the 2002 reissue of the movie, which digitally replaced police guns with flashlights. Steven Spielberg’s smash hit was the latest in a string of successful blockbusters, from “Jaws” (1975) to “Close Encounters of the Third Kind” (1977) to “Raiders of the Lost Ark” (1981). “E.T.” was the most successful of them all. If you adjust for inflation, it’s the fourth highest grossing movie of all time, behind only “The Sound of Music” (1965), “Star Wars” (1977) and “Gone With the Wind” (1939). To put that in perspective, “Avatar” (2009) sits at 14 and “The Avengers” (2012) sits at 31. Perhaps this was because of the film’s childlike wonder. The late Patrick Swayze called it “the most immortal children’s movie that’s ever been done,” and you can see its influences today in everything from “WALL-E” (2008) to “Super 8” (2011). It launched the career of Drew Barrymore, featured a vocal cameo by Debra Winger as E.T. and pioneered a new generation of puppetry. It also provided one of John Williams’ most enchanting scores, ranked 14th all time by the American Film Institute. The AFI also ranked the film the #6 Most Inspirational Movie of All Time and the #24 Greatest Movie of All Time. 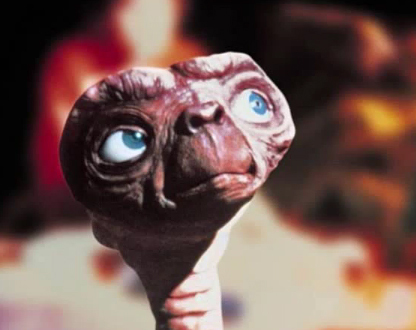 Its most quotable line — “E.T., phone home” — landed at #15 on the AFI’s 100 Movie Quotes. Since the film’s phenomenon, many theories and stories have surfaced, from director Satyajit Ray claiming the film had ripped off his original story, to academics pointing out the film’s parallels to the Christ gospel. After all, E.T. is discovered in a shed, raises plants from the dead, flies on a bike (walks on water), dies, is resurrected, then ascends back to the heavens after touching Elliot’s forehead. Spielberg welcomed the analogies with good humor, saying, “Here I am a Jewish boy making films about resurrection.” No matter what you call it, it’s a film about friendship, imagination and coming-of-age amidst your parental divorce.